The allure of French style can be maddeningly mysterious (just ask a guy what "je ne sais quoi" means to see our point), so we were thoroughly delighted to come upon a concrete tip that anyone can try. 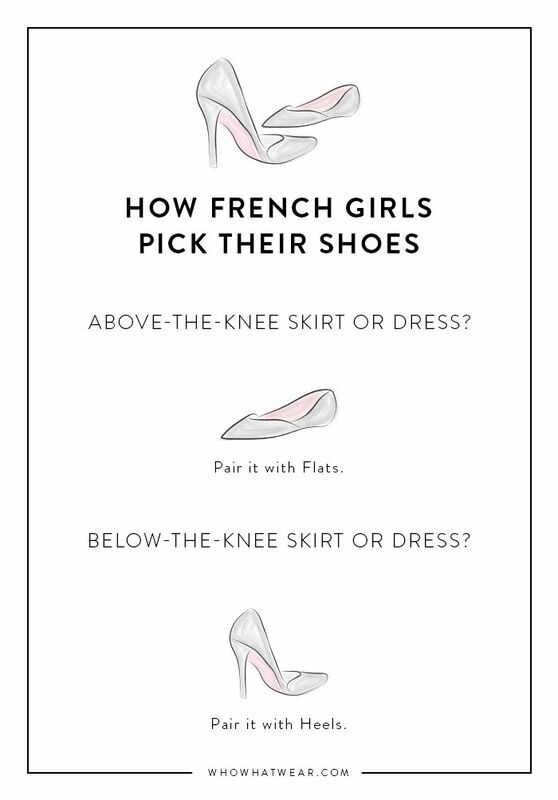 Cupcakes and Cashmere’s Emily Schuman recently posted about a French rule of thumb from one of her Parisian readers that’s too good not to share. Essentially, if you’re wearing a longer dress or skirt, opt for heels, and if you’re sporting a miniskirt of mini-dress, wear flats. This little trick will ensure your outfit proportions are always on point, and that you’re showing just enough skin. We pulled some street style outfits to illustrate the rule, and have to say that it works every time. Scroll down to see if you agree whether flats really look better with a shorter hemline, and heels with a longer one. Then shop our skirt and shoe pairings, and pin the slide below for future reference! Next up, check out How to Dress Like a French Girl at the Airport.